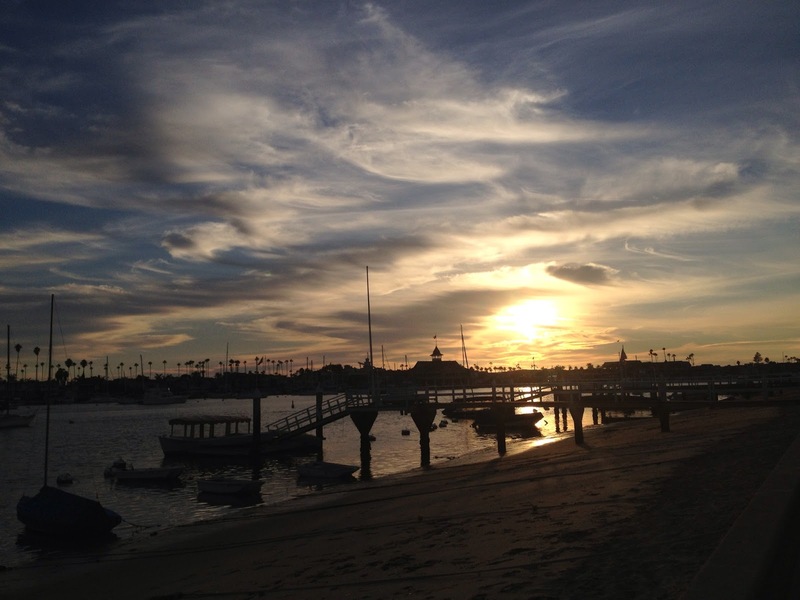 I guess there are worse places to be stuck in when Sandy messes up your New York plans. Traveled to get my annual dose of home in New York, but first made a pit stop in southern California. Plans changed when Hurricane Sandy hit New York, followed by a snowstorm that blew in a week later. Stuck on the west coast this Autumn, Norman brought me to some of his favorite spots and we explored a good handful of restaurants that were new to both of us. Suffice to say, we've both gotten visibly softer around the middle section. Here's the list and the verdict below. 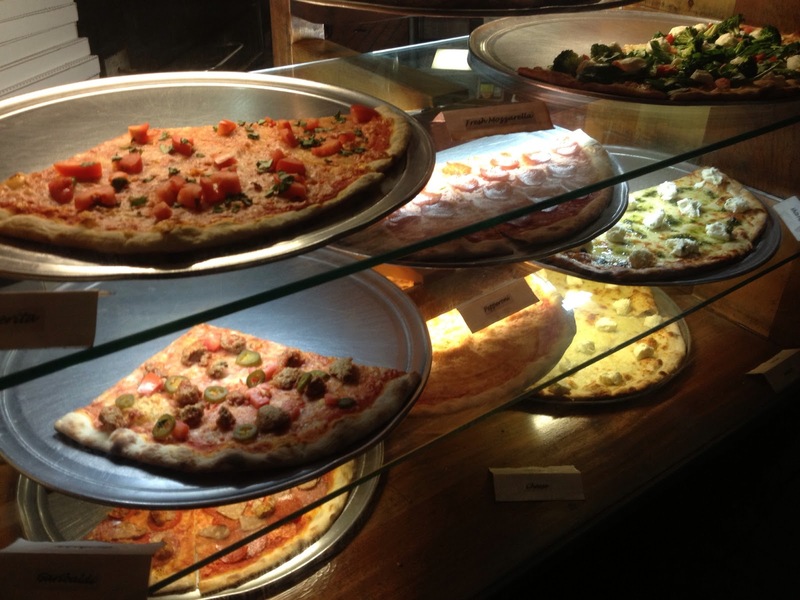 Reputation: This joint is repudiated as one of the best pizzerias in LA, and serves some of the best NY-style pizza on the west coast. It's been reviewed among many publications and blogs as being able to stand among the best in Manhattan. Verdict: I disagree. There is nothing New York about the place. Even the service is anything but New York -- Louis, the guy handling the cashier was probably the nicest and on-the-ball pizzeria server I've come across. Ever. Patient, outgoing, offering utensils, extra plates before we even thought to ask, and he sports the most genuine smile I've seen on the west coast. Unfortunately for LA, if this is the "best" NY-style pizza this city has to offer, then I dread what the pizza must be like in the rest of the area. After being welcomed by the likes of Louis, we started with a white cheese pesto slice -- it was an exceptional start to our pizza stop. Big dollops of sweet, creamy ricotta is generously dotted across the pie, coming together into a rich bite with swirls of pesto and olive oil. This pizza is highly recommended. It started to go downhill when we tucked into the fresh mozzarella slice and the Garibaldi (meatball, jalapeños). The crust was too thin and flimsy by any standard, and it lacked any flavor. Save for the amazing ricotta, it seems LA has yet to master the NY pizza... but I guess that's why it's called a "New York style" pizza in the first place. Reputation: It's hard to miss Carney's. 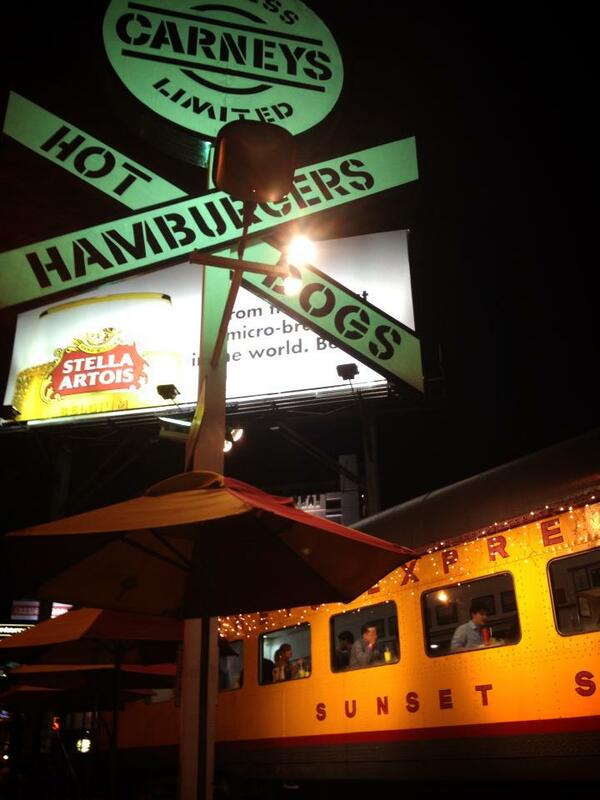 A yellow train car sits along the Sunset Strip with an enormous crossing sign advertising burgers and hotdogs. Mr. Hartono explained how Carney's is practically a Los Angeles landmark since its opening in the late '60s and is a must-visit for any LA-noobs such as myself. Verdict: Skipping the burgers, we popped by just for a quick hot dog (we still had Pink's Hot Dogs and K-Town food to do next). 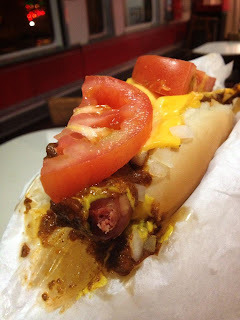 Call me simple or call me a New Yorker, but I like my dogs with nothing more than mustard, ketchup and sauerkraut... or else a chili cheese dog. It was a chilly evening and the sight of all the tall leggy aspiring-actresses strolling along Sunset Blvd made me crave the more gluttonous option of the latter. The dog was thin, juicy, flavorful, and the outer skin had that vital snap as my teeth broke through the top layer. I could have done with some chopped raw onions on this baby, but the addition of fresh tomato slices was a nice touch. Maybe it's because I live in Singapore now and haven't had a good hot dog in almost two years, or maybe the hot dog really was that good. Reputation: I hadn't gotten the chance to try any food trucks during my stay in LA. On the last day, my flight was postponed by 12 hours. I was so angry at United Airlines for once again screwing up my travel, but it gave us the opportunity to scout out a food truck or two in between. Norman found a bunch of trucks on the way back to the airport, and we were drawn to the rather unusual name, "Slap Yo Mama Truck - Soul Food". Verdict: The woman taking orders saw what must have seen the look of indecisiveness on our faces. With a smile, she welcomed me to California, then listed her favorite eats from the neighboring trucks, "Have you ever had Grilled Cheese Truck? The grilled cheese at the truck next door at Pigs Feet Under is even better, hands down. And I love Rancho A Go Go Barbeque - I've never had pulled pork better than theirs. See that truck across? They do a cool fusion of Japanese and Persian cuisine..." She listed a few more before modestly introducing one of their own truck's specialties: The Snoop Dogg Crizto. I've never tried Roscoe's or any other chicken & waffles place before.... and now was a good time as any. The Snoop Dogg Crizto was named as such (renamed, actually) after Snoop Dogg/Lion himself had the dish and declared it one of his favorites. It's serious biz when you have chicken and mac n' cheese enveloped in a thick cushion of waffles and syrup. Don't get too excited or worried about the white dusting on top. It isn't coke. It's icing sugar -- which in my book, is close enough. I officially dig chicken & waffles - I crave this dish even whilst I type this now in Singapore. I think Norman was quite literally licking the plate clean that evening, while I was polishing off Rancho A Go Go's pulled pork. 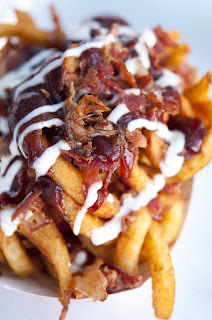 The Porky Fries from Rancho A Go Go is out of this world. Slap Yo Mama was not kidding when she said their pulled pork was some of the best out there. The juicy, soft pulled pork was served over curly fries and topped with tangy barbecue sauce. If we hadn't already gotten the Snoop Dogg Crizto and a bacon grilled cheese, I would have gone back for seconds (next time, I'll be trying the "Rhino" - pulled pork grilled cheese stuffed with mac n' cheese). We finished the Bacon Grilled Cheese from Pig's Feet Under last. I've never had a grilled cheese with so much bacon before -- and we're talking perfectly cooked bacon. The generous portions of bacon were cooked crisp, but not till burned. It was salty, flavorful... god, I love bacon. The fig jam was a nice touch; its natural sweet and tartness balanced the bacon. We were least enthusiastic about the grilled cheese in this one instance, but only because the other two dishes we ordered were heavy on the caloric richness, making the bacon grilled cheese combo seem more subtle. It still, however, is one of the better sandwiches I've had.